Condition Calculator 4.0 Reliability Direct, Inc. Your Direct Source for Reliability, Maintenance, Test & Measurement! Motor ID, Test Date, Phase Test Results, plus enter results from the AT31's unique rotor test, EMI Test and phase balance test! 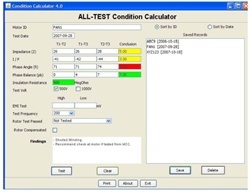 NEW Condition Calculator makes it a Breeze to analyze potential faults. Enter the test results into your PC and it gives you an answer every time!